Mindset is key in every area of our lives and it also has a huge impact in our pocket. Sometimes your mindset could trick you because of the lies about your finances that you tell yourself. 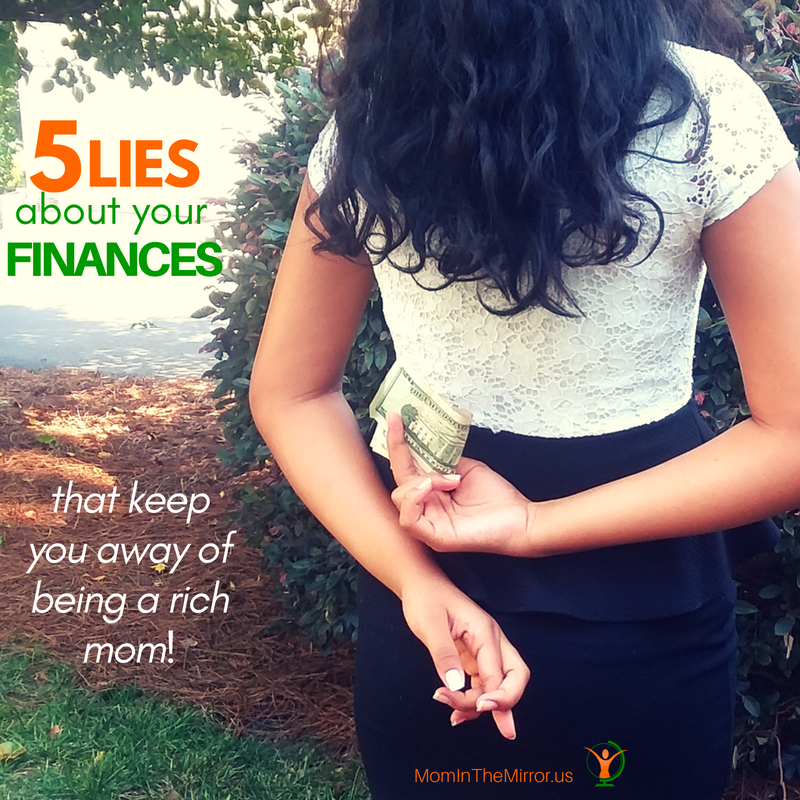 Almost every time I talk about money to relatives, friends and moms, there are several lies that show up in the conversation; lies about your finances that keep you away of being a rich mom. And I have to confess that there are a few of them that I have told to myself from time to time. I share 5 of the more common lies about your finances in order you could identify which ones you are telling yourself so you can overcome them and move forward into being a rich mom. Money is a tool that helps moms have access to better choices when it comes to food, health, education, and many other areas of life. I have a friend who thinks money talks are bad and that the less she talks about money issues the better for her. Even though she doesn’t like to talk, plan, or being strategic about money, she needs to use it in a daily basis. Many times she ends up spending more money that she will miss later for buying other goods. When you recognize the importance of money you are able to plan ahead the finances matters, to do better choices, to fulfill your payments on time, and to save money for emergencies and for the future. Giving yourself a special treat, a gift or any other reward is good as a manifestation of self-love, but when you tend to buy many things and you mask your uncontrollable shopping habit under the “I deserve” lie, you may be falling into the instant gratification trap. This is one of the most frequent lies many moms tend to say themselves. I know you work really hard and you are doing your best in parenting, as wife and as woman, however, it doesn’t mean that you need to indulge yourself continuously. Instant gratification prevents you from having money to save and to plan your future financial life. A rule I usually apply to identify if the buying I’m about to do is not a real need is asking myself such as: “what are the consequences for me and my family if I do buy this now? Do I have the cash to pay for this and—if I do—will it cause any rush to my budget and other expenses?” Most of the time I end not buying it and it has helped me to move forward financially. Many people are afraid of using credit while others use credit intensively, thinking that credit is the only way they can use to build their lives and acquire the material things they want. The truth is that having credit is not bad when it is used wisely. Rich moms use credit to leverage their income and their businesses and so can you. However, this is not the only way. A few years ago, my husband and I were broke and while in the crisis, we decided to stop taking more credit to concentrate in paying off our debts. By that time, we used to live 100% on cash. Groceries, home appliances, material goods, clothing and other expenses were paid fully on cash by making budgets and planning ahead of time. I believe that anyone could live without credit, and I know you have what it takes to do it, even though I know sometimes budgets and planning scare moms like you. The process of acquiring things you need with cash will be slowly if you compare it with paying with credit, but in the long term you will save money that you could use to build your wealth. If you´re not part of the 15% of Americans that are living under the line of poverty, I assure you that you can save money. It does not need to be a huge amount of money, your savings need to be in proportion to your earnings. I started saving when I was in high school. I recall that everybody was talking about a new opening in town of a pizza restaurant. My friends and I wanted to taste the new pizza, and we started planning to go out. We didn´t receive any allowance and we wanted to do this on our own, without having to ask our parents for money. So we saved money during 3 months and when we finally went out we had saved enough money not only for the pizza and taxi cabs, but for buying ice cream and there was also money left for us to start planning our next teen-adventure. That was a great experience for us and that day I learned that with a goal in mind, and the intention, I could save money to achieve anything I wanted. It worked for me then, and still now, so I´ve kept this habit. Whether you save $10, $100, $1000 monthly or a percentage of your income, you are winning. Eventually, you will have money to achieve your financial goals and make further steps to invest and take the advantages of the compound interest. Wealth is measured according the amount of months a person can live when her paycheck disappears. It is not related to the size of the check, so it is a lie when you think you’re doomed to be poor just because you’re poor. There are thousands of cases of people that being raised in poverty have had the ability to break the circle of poverty in their families and pursue their own wealth. Stories such as Oprah Winfrey and Michelle Obama keep me inspired as they have overcome the adversity in their lives to become wealthy. By unveiling the truth to all of these lies will help us to take charge of our finances. Having a good relationship with money is key for us to achieve our desired financial future. Share any other money lie you have heard. Why do you think it is a lie? This entry was posted in Improvement by YeimiSantana. Bookmark the permalink.